David Poli investigated cloud-based energy monitoring dashboards. AT&T hosted EDF Climate Corps fellow David Poli to investigate pilot projects for evaluating cloud-based energy monitoring dashboard systems. The intention was to select a complete solution for approximately 1,000 of AT&T’s highest energy-usage locations. Building on work performed by previous EDF Climate Corps fellows for AT&T, Poli investigated more than ten solutions involving hundreds of buildings in AT&T’s portfolio. These buildings represent a wide variety of assets, including administrative high-rises, central telecommunication equipment offices, data centers and cell towers. Despite the time constraints of his fellowship, Poli made significant progress on several of these pilots, providing savings analyses, innovative financing strategies and employee engagement tools. These systems, which are accessible both on-site and remotely, have the potential to optimize facilities operation and visibility by providing real-time energy-use feedback. Poli trusts that future EDF Climate Corps fellows will be instrumental in the progress and expansion of this ambitious project. 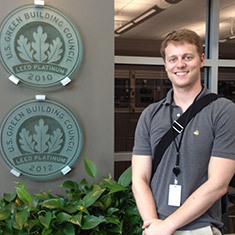 David Poli, a student at Santa Clara University, was hired as a 2013 EDF Climate Corps fellow at AT&T.